"The Georgia Capitol Museum is almost as old as the Capitol itself. In 1889 the General Assembly revived the Office of State Geologist. The legislation directed the geologist to complete a survey of Georgia and to create a museum. The exhibit would demonstrate the state's natural and economic resources. The collections grew quickly and spread throughout the building. Over the years the museum's emphasis expanded as new displays joined the old, educating generations of Georgia schoolchildren and other visitors." 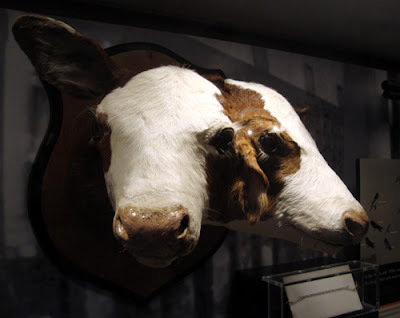 Of all the artifacts in the Georgia Capitol Museum, the two-headed cow has consistently remained a favorite of visitors touring Atlanta both young and seasoned, local and international. Coincidentally, there was a two-headed cow born in the Republic of Georgia earlier this month. The Museum is always on the look out for new artifacts to tell the story of the Georgia Capitol. If you have an item(s) that you would like to donate, contact the Museum.